In Your Life Manual, Practical Steps to Genuine Happiness David Ambrose provides a straight forward, easy to read guide to the happiness we deserve in our lives. Full of practical advice and a philosophy that caters for all regardless of religious beliefs Your Life Manual is motivating and uplifting. Full of personal experiences and scenario's it is easy to relate to everyday life situations. He acknowledges that when it comes to self development there is no such thing as one-size-fits all, we all have our own personality and needs. David encourages your right to disagree with anything he has written, encouraging you to analyze your reason for disagreeing. He sees thinking about things as an enriching process, understanding the reasons for your opinions as valuable. For some this book may at first seem challenging and confronting but it will soon provide food for thought and have them questioning their acceptance of the way society functions and how they intend to sit within. I started this book with an open mind wondering how it was going to fit into my life. I consider myself to be at peace with where I am at this current moment and happy with the road my life is taking. I am confident in my choices and happiness abounds me, so how could Your Life Manual create me more genuine happiness than I already had? I need not have wondered as I found this book suitable for all regardless of what stage in their life they are at. Your Life Manual is rich, pure stimulation for the mind. It is thought provoking and provides a place for one to assess, reassess and connect with their current life and circumstances, good, bad or indifferent. As I worked through the sections I was left questioning my views and the process I have taken to get to where I am today. I delved deeper into the road I am travelling and the road I wish to take. I was left assessing the way I cope with the walls that are placed in front of me. Section three, The Transformation, helped me find my 'self time'. As I worked through the 'sittings' I explored my mind and soul on a level much deeper than I normally would. I was able to explore my being, both negative and positive, in a non threatening way, becoming at one with my future happiness. 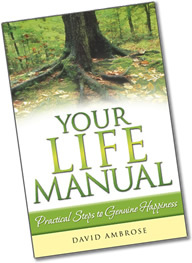 Your life Manual is more than just a book, it is a way of life. Once read you will be empowered to continue along your new found road of happiness, affecting all who you meet. People will relate to the new you in a more positive manner and pay it forward, creating a chain of events that will only be of benefit to all. 'The Philosphy' of Your Life Manual speaks of the topics of love, peace, freedom, harmony and happiness. In chapter 10 David speaks of our absolute rights; The right to love, The right to peace, The right to freedom, The right to harmony, The right to happiness. He speaks of the rights to 'all creatures' rather than that of 'all people'. Your Life Manual is about steps that you, the reader, can take to increase all the above experiences in your life while at the same time generating the flow around the world. Through Your Life Manual David reinforced my love of life and the importance of balance and happiness within my world. This book is the starting point to a new you. A you that has the skills to continue to find happiness and fulfillment in all you do. Winner of the Readers Views 2007 Reviewers Choice Award I highly recommended Your Life Manual, Practice Steps to Genuine Happiness. It will empower you to do everything at the best of your ability finding the happiness within. It will empower you to listen to the messages your feelings convey allowing you to create much more happiness. You will tune into what your feelings are saying making problems easier to process. You will be able to make informed decisions leading to further happiness and empowerment of the mind.